As smart phones started becoming necessity of time, we forgot that to use them we should also be smart enough. Irony is that phones are getting smart and we are getting dumb. Evolution of technology lead to encroachment of our lives by social media more than required. Facebook, twitter, whatsapp all social channels are in reach of every common man nowadays, but we have left the basic intelligence to use this social media in a constructive manner. Whenever we see a post (better to say a sensational post), we just click on share button without trying to know whether it is real or a hoax. We don’t care for the reputation of any one, we don’t verify the source of information even before sharing derogatory posts or news about someone in social media. We think it’s on Facebook, then it must be true. really is it the case always ?? If you can’t relate to the story so far, let me walk you through some of the recent cases which you must have come across at least once. Remember this post? Of course we do. JNU incident is not one of those that can be put on a shelf after 48 hours. People expressed their anger and support in numerous ways. We saw 1000s of social posts that defamed JNU University and its students. This post was one of them. Without confirming the source and validity of the news, everyone started sharing it on social media. we cannot even imagine that how the people of such an advanced era clicked the shared button of a fake post and the count of share reached in Laks, where off course at times this spread rumours in social are planted as well but talking briefly what percentage of total people doing such littering are planted , believe me only 1% or 1.5 % rest all are us who just go by the winds , without using our intellect and wisdome we just love sharing it !! 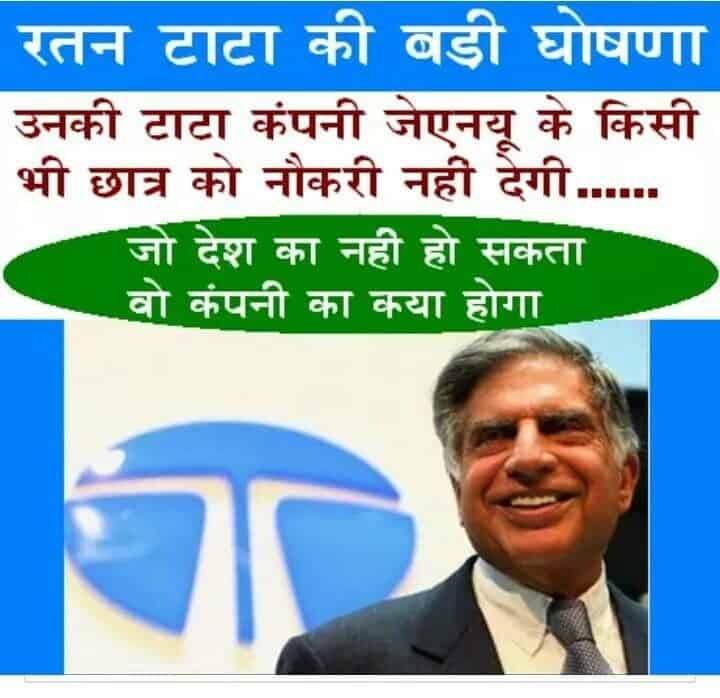 After this, officials from TATA had to come forward and clarify that Ratan Tata had not issued any such statement. I wonder whether those people who had shared the post had deleted this or it is still visible on their timeline? How many of you considered this as a true news in first view? Normally everyone does after reading the headlines , just try peeping in the content below hazed intentionally .Any educated person looking at it carefully, would get to know truth of fake post. Headline is saying something else and description is totally about religion conversion. Even the date printed is 24-12-2013, when there was no Kejriwal and no Hardik Patel. Still when we see these kinds of posts, we click on share button without realizing that it could defame someone who might not be the culprit. We are very much confident that everyone must have seen this post at least once on their timeline. Its origin is not known but the followers shared the post in range of lacks. Popularity of this could be guessed from the fact that Wikileaks had to come forward to state that they have not made any such comment about Modi and this social post is fake. Another rumor spread during Jaat agitation in Haryana that hotel Amrik Sukhdev of Murthal has been burnt. This news was also shared on facebook and twitter without confirming the truth. It also came out to be fake and owners have to clarify the right situation. Remember this interesting post where everyone got impressed by the Samsung’s way of taking revenge. This news was all over the internet but was neither confirmed by Samsung nor by the Apple. If we think logically, this story will be proven hypothetical. To pay off 1 billion in nickels, Samsung would have required 20 billion coins. A single nickel weighs about 5 gms, so total would be 110,000 tons. In order to transport this much weight, 30 trucks would be too less to think of. For this about 2755 eighteen wheeler trucks would be needed. Suggestion lies in fact, social media is such a powerful medium and we should use it smartly. No matter how much you are impressed with the post, a single google search would be enough to validate the news and to get the source. We should try being smarted than our smart phones, lets not this smart world or i would say acting smart technology made by us only to rule our wisdom, everything we do ,we share on internet is effecting others theses day , we should try getting not influences with the motive of the things, think twice before making any social share of anything , a positive post is a personal say but are we really sure that it is going to be positive for others as well . lets think it hard , if we cant think it simply. Other side of the coin…………….